I loved the burnt orange and brown colors for this wedding! 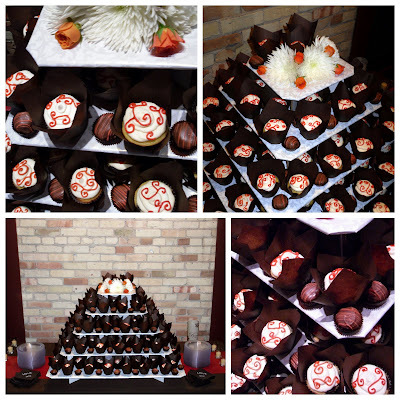 The cupcakes were marble with ivory buttercream and burnt orange swirls in tulip liners and the cake truffles were chocolate raspberry with burnt orange drizzled on top. Not only were they fun to make, but the couple (Trent and Linda) were absolutely fantastic to work with! 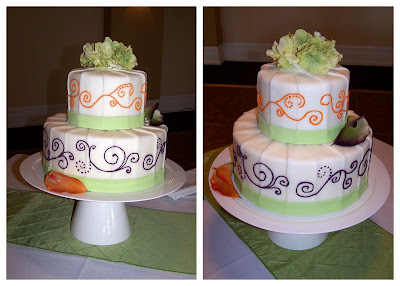 I loved the design (the bride's idea) and of course the colors! 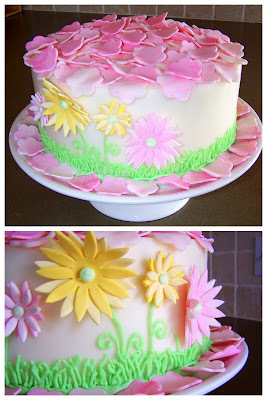 We decided on icing covered with fondant decorations and fake flowers, which I think worked out well. Steph, thanks for letting me be a part of your wonderful day! 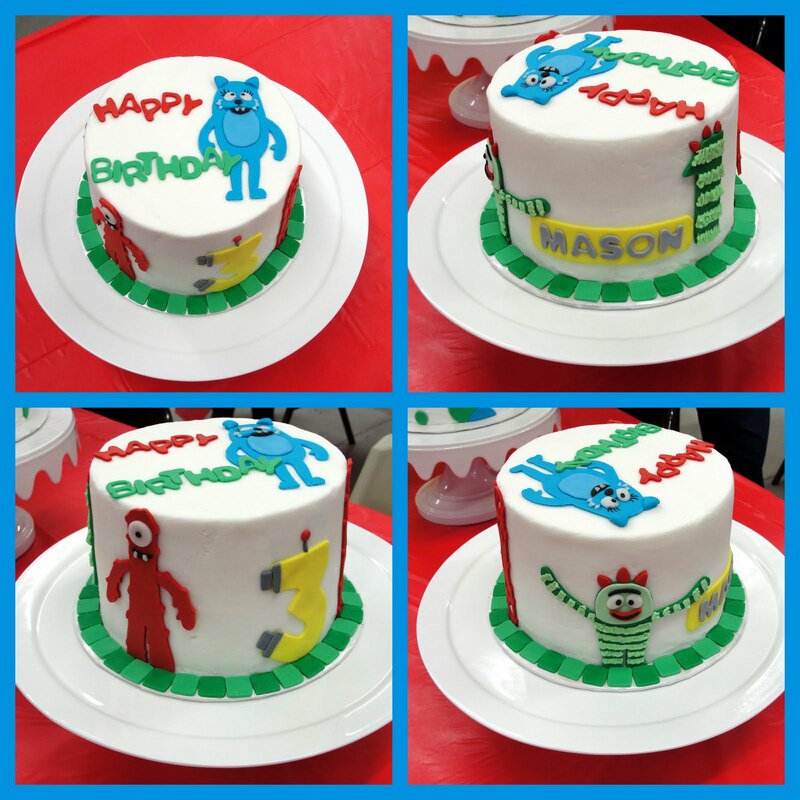 I was not familiar at all with "Yo Gabba Gabba" until I made this cake for an adorable little three year old and his one year old brother. It was a good challenge and actually quite fun to make! I also made a smash cake for the one year old to match. As you can imagine, my kids have big dreams for their birthday cakes. They seem to think that I can do anything (I had to turn down a few ideas that they had, as I'm just not as talented as they think :) ). 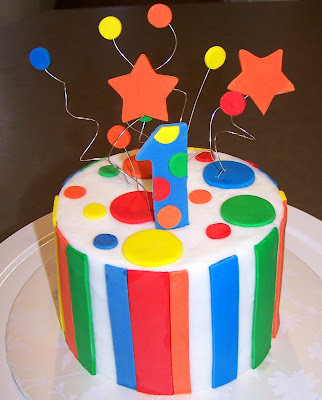 In fact, Madisyn is planning out the cakes for her 6th and 7th birthdays as well as Landon's 4th and 5th! I'm sure they'll change their minds 100 or so times before next year. None-the-less... Madisyn decided on a castle cake this year. 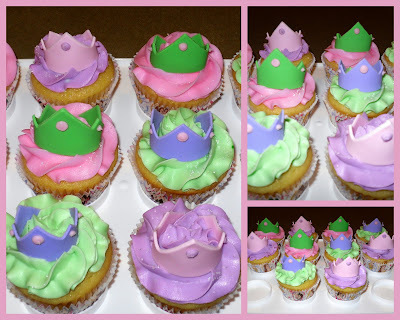 Similar to her cupcakes, she wanted it green, purple and pink with polka-dots. 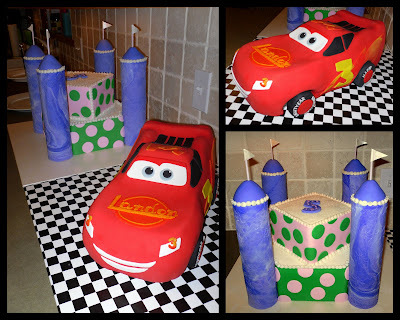 And that, she got :) Landon of course wanted a Lightning McQueen cake and was thrilled to tell everyone about it and show it off! All the hard work pays off when they're thrilled with the outcome! Thanks Ra (Aunt Shell) for all of the help! As always, I couldn't have done it without you!!! 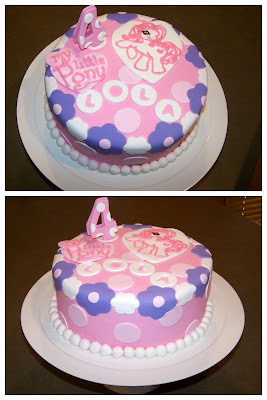 A "My Little Pony" cake for a little four year old, Lola. As some of you have asked, I would love to have an evening to share some of what I've learned... and have an excuse to get some women together! Email me if you are interested in joining us for a night of decorating your own cake and learning the fun of fondant (tieceofcake@yahoo.com)! The date will likely be late spring (April/May) and you'll take home your personally decorated 6" round cake (cost will likely be $30). A few of you know that my wonderful husband turned 30 last month. Along with our cousins, we threw a small surprise party for our four dear friends who were turning 30 around the same time. Needless to say, the cake was also supposed to be a surprise (difficult to pull off making a three tiered cake without my husband knowing who it was for :) ). But we had one major accident... the cake fell over as I was placing it into the car! It was like slow motion. Fortunately, I caught it, but not without a lot of damage. It was quite the rush of emotions and a very good learning experience :) Needless to say, in about an hour, I had somehow replaced and fixed all of the dents, holes and major blemishes! Allison, thanks so much for taking pictures! I just want to give a heads-up that I'm booked through mid-April. I know most people don't think about ordering a cake three plus months in advance, so I wanted to let you know in advance. If you are interested in ordering a cake for April/May, please contact me as soon as possible, as those months are filling up quickly as well. Thanks so much! 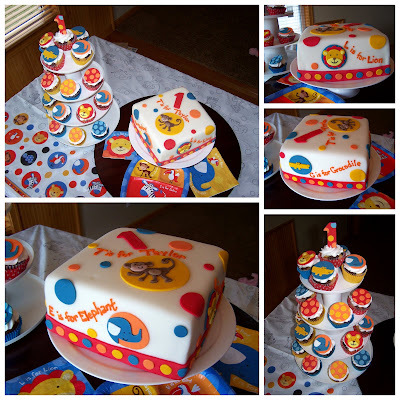 I was lucky enough to have an old friend of mine contact me to make a "smash cake" for her son's first birthday. She basically let me do whatever I wanted to do and suggested primary colors. 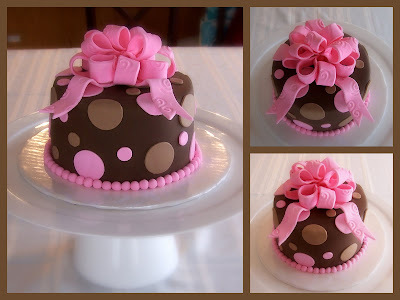 I had been eager to try out some of the decorations that "pop" out of the cake, so I used this opportunity to do so. It had its challenges, but I was excited about the outcome. I think I'll be trying this again in the near future! Megan, thanks again for being laid back about the cake, that made it so much fun! And I'm just glad that we got to see each other after so long!!! This one was vanilla with buttercream icing and raspberry filling (the perfect combination, in my opinion). It was a wonderful pleasure to meet an "extended neighbor" who ordered this for her daughter. Thea, thanks again for your wonderful visit! For those of you who don't know me... or even for those of you who do, I feel like you deserve to hear what others have said about desserts I've made for them. 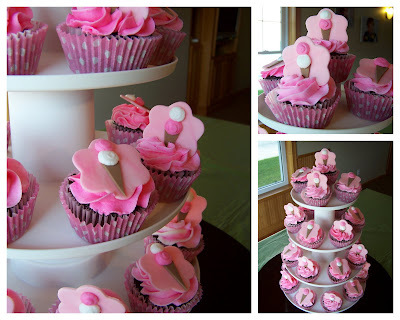 Cupcakes to match table decorations for Ella's 3rd, Dylan's 5th and Matt's 30th birthdays! 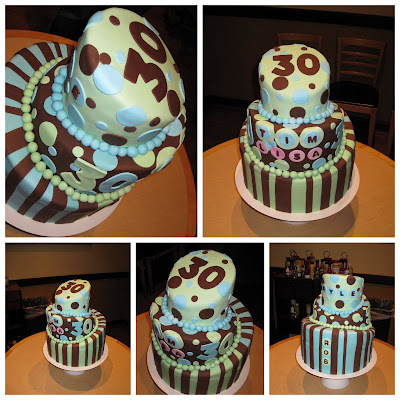 This was too fun... it was a surprise birthday cake for my sister, so I could do whatever I wanted! Happy Birthday to the greatest sister ever! Love you, Ra! 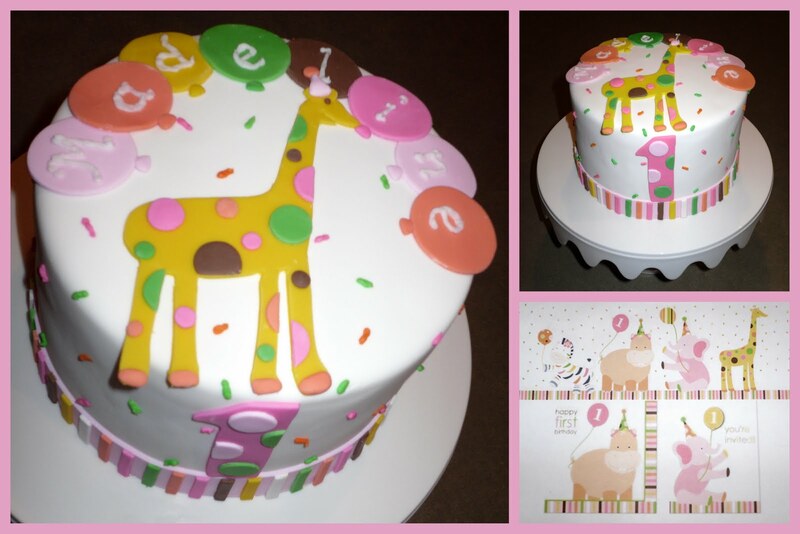 This cake was a lot of fun with the bright colors and fun animal designs! These are some serious trouble! My favorite is lemon mousse, but the chocolate raspberry seems to go quickly as well! 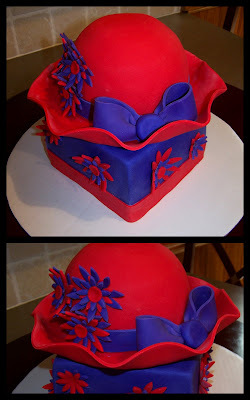 Sue, thanks for letting me make this cake for your Red Hat gathering! 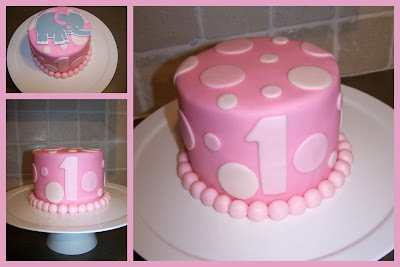 This cake (the one including the elephant) is being used for a little girl's one-year pictures. 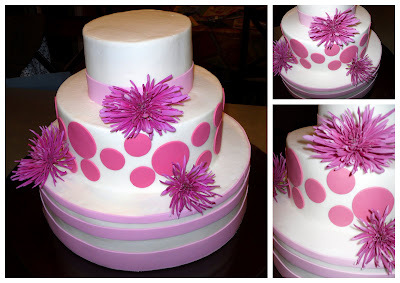 I just fell in love with the pink polka-dot cake before I added the elephant. If I were to create the perfect cake for me, this would probably be it! Congratulations Josh and Linsey! Thank you for letting me (and my wonderful sister Rachelle) make the cake for your special day! 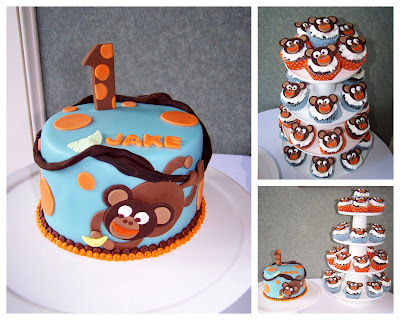 Jake's monkey cake (vanilla, chocolate buttercream icing with buttercream fondant) and cupcakes (chocolate, buttercream icing with chocolate fondant monkeys) for his first birthday. Our dear friends' daughter Isabel turned two last month! I wish I had a picture of her with the cake, she is just so stinkin' adorable! Cake was vanilla, lemon mouse filling with buttercream fondant. I'm a stay-at-home mom who tries to keep up with her wonderful husband and two amazing children. Aside from doing anything to make my kids laugh, running, and trying to keep our house clean and organized, I love experimenting with food and designing cakes (and cupcakes). I hope you enjoy my creations!